We are involve in the manufacturing and supplying of Tungsten Unit Dose Pig, which is commonly known for the Radiation Shielding. It is especially manufactured by using advanced range of pure tungsten metal and available in different eye catching designs. The construction of the offered metal dose pig of weight 2.8 kg or 6 lb is full tungsten the outside and the inside. 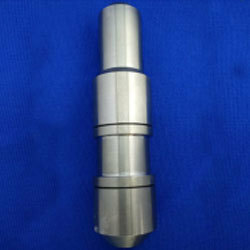 The specification of the Tungsten Unit Dose Pig has dimensions of 8.5" h x 1.94" dia. (22 x 4.9 cm) with nominal thickness of 1.27 cm along with the tungsten shielding 0.5''.